Some of the best dishes I have ever created have were developed, not because I followed the recipe correctly (I am really not good at that) but rather because I didn’t have all the ingredients listed, and had to just wing it. For all you recipe followers, I know that is a tough concept – just call me a rebel in the kitchen. With summer gardens in full bloom for the season, this Summer Green Vegetable Salad is the perfect vehicle to use up whatever happens to be ripe in your garden now. I used haricort verts, tiny french green beans, though regular green beans work as well. 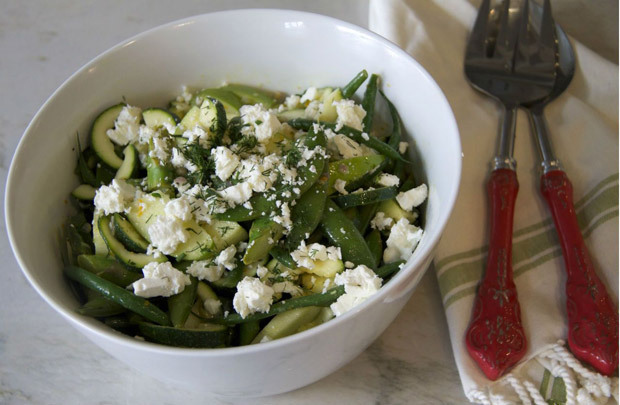 In place of snap peas you could try snow peas, no feta cheese? Try Manchego or goat cheese, dill not your favorite? Use parsley and basil instead. Follow the recipe, or create your own interpretation. Is today the day you want to be a rebel in the kitchen or not? Fill a large bowl with ice water and have it near the stove. Add the green beans to the boiling water and blanch for 1 to 2 minutes or until crisp tender and bright green. Use a slotted spoon to quickly transfer to ice water. Add the snap peas, cook 30 seconds to one minute depending on how large they are, transfer to bowl with green beans. Now add the asparagus to boiling water and blanch for 2-3 minutes (longer if they are quite large), or until barely tender. Transfer to the ice water with the beans. Once cooled, drain and pat dry and transfer to a large bowl. Add the snow peas and zucchini. In a small bowl whisk the olive oil, shallot, orange zest and juice, vinegar and mustard. Pour dressing over vegetables and stir gently to coat. Let sit at least 30 minutes. When ready to serve, top with sliced avocado, feta and dill. Find more of Pamela's gluten free recipes at PamelasGlutenFreeRecipes.com.